Here is an example. 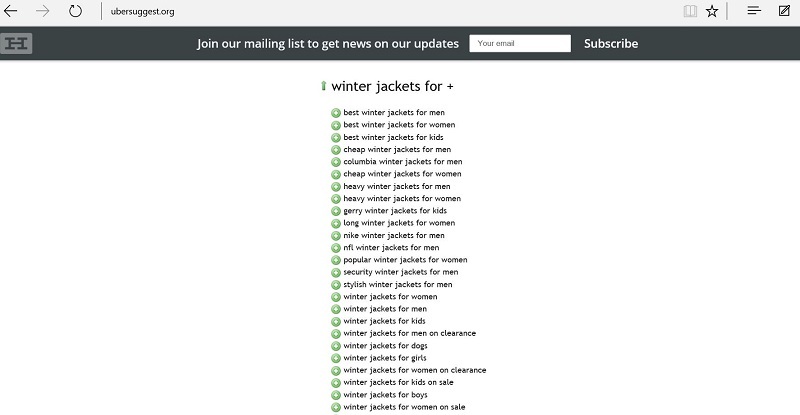 You work for a company that sells a wide range of winter coats. With the holidays literally starting now in the United States, you need to take advantage of everyone who could be interested in buying from you and conducting a search to begin their process to buy. You are given the task to expand upon the keywords in your Bing Ads campaign from your boss, but you are strapped for time. What should you do? In this video tutorial, I am going to show you how to use Uber Suggest and the Bing Ads Intelligence Tool to get fast yet precise data to share with everyone. Both tools are free as well! Here is a link to learn more about how to use Bing Ads Intelligence. Did you know about the auto suggest that Bing provides in their SERP’s? Maybe yes, or maybe no. Since I started my career in SEO, I just assumed everyone was aware that they could use this to their advantage for keyword research. If you are not familiar with this, I am going to break this down for you. Bing will show related keyword suggestions for you based on what others have searched for from that query, or a similar query. With the large volume of queries Bing processes every second, you are getting pretty up to date results for what is trending and being searched for on the search engine. Since this is getting updated so quickly, you might not see any search volume for some of these related or suggested keywords. Fear not though, I would still mark those suggested keyword as opportuntiies for my campaign since people are searching for them on the search engine I am advertising on. Makes sense to me. The SERP is great way to get an idea to what people are searching for. The SERP will also give you a visual on things like Bing Shopping, PPC Ad Style, and the Organic Results. However, I want to save my time when performing this task, so I am going to head over to Uber Suggest to scrap all the auto complete suggestions for me. From here, I am going to select all of the keyword selections and dump them all into excel. Man, I can’t explain how much this tool will save you time while conducting PPC research for your job. I am going to select all of the keywords I just imported from Uber Suggest and I am going to run a traffic report. From there, I am going to pivot all of the data to get a real quick snapshot of the search volume for desktops and smartphones for these terms. If you are interested in where I went to pull that traffic report, you will see exactly where I went in the video for this page. Performing research for PPC optimization should not be done in a few minutes and call it a day. However, I believe that some things simply can be done faster to allow you more time to actually use your skills to make the steps to optimize those keywords for your campaign. You can run a bid report for those keywords and figure out what the rough cost per click would be, you could test different ad groups for these keywords and have better ad copy for them, you could even run certain parameters that call out specific sales for some of these items. Regardless what you do next, you now have more time to carefully make those changes with the time you just saved by using Uber Suggest and the Bing Ads Intelligence tool!